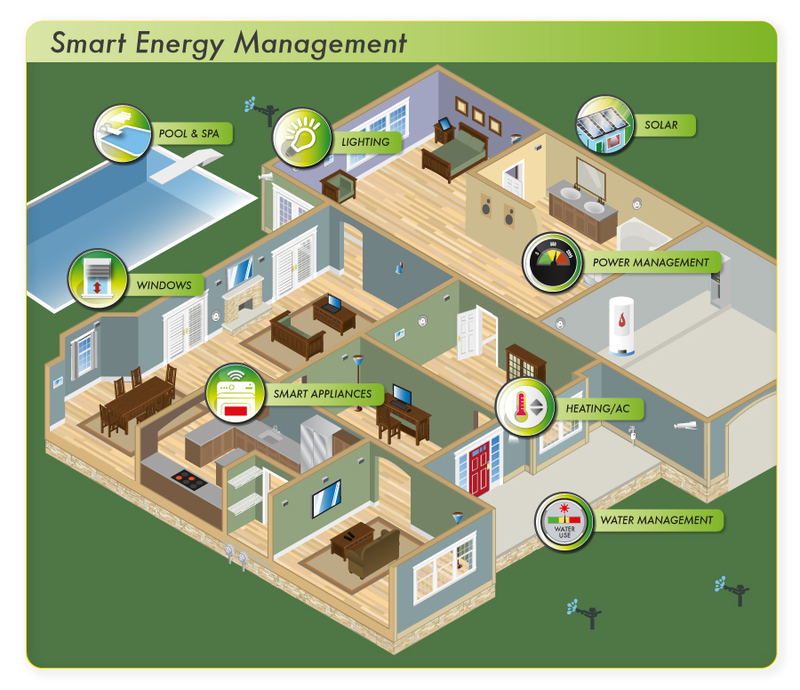 Take charge of your utility bill and water use with smart energy management technologies. Thoughtfully implemented, they’ll start reducing your utility bills from the day they’re installed. Plus, you’ll enjoy the added benefits—the comfort and convenience that many of these solutions provide, like lighting control and automated window coverings. Comfort. Energy management solutions let you anticipate and optimize cool comfort inside in summer, and the warmth you need when the weather turns cold—not just by controlling the heating & air conditioning, but also with automated window coverings and lighting control. You can even manage pool and spa heating cycles. And if your plans change while you’re away from home, you can make adjustments it remotely. Savings. Smart control of lighting, window shades, and heating & air conditioning will help you conserve energy while reducing your utility bills and carbon footprint. Then take the next step, with home power management. It maximizes the savings by letting you track real-time use of all your energy-consuming systems, so you can address the consumption patterns of the household based on hard data. For the ultimate in savings, install photovoltaic solar panels to generate your own power, and sell your surplus back to the utility company. Practicality & Convenience. Manage smart appliances, your sprinkler system, sauna and steam room cycles, and other household amenities on your tablet or smartphone. No matter where you live, energy management will make your life more comfortable and convenient. Click on an icon below to learn more about Smart Energy Management, Entertainment & Automation, or Smart Home Security.